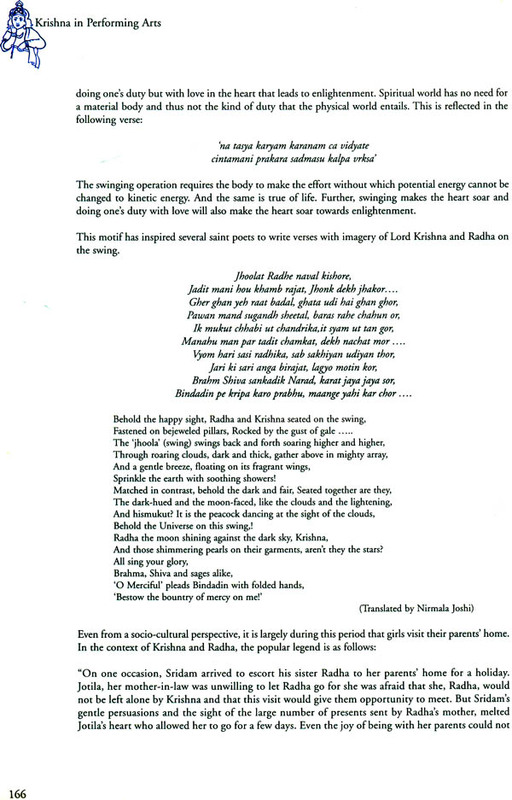 Krishna is a subject that holds eternal fascination for writers, poets, philosophers and artistes. He demands love, faith, devotion and surrender. He has been the favourite subject of researchers and authors. Many books have featured him in their critiques covering various facets of his personality. This volume Krishna is Performing Art is one of its kind' for it is a monumental work that presents a detailed exposition of the multi-faceted influence of Krishna in the field of performing arts. He has influenced poses and stances of certain dance forms; he has been associated with 'raas', 'maharaas' and the 'madan bhramari'; he has caused development and evolution of whole genre of dance theatres, operas, classical dance forms, ballads, music forms, rituals, make-up and costumes associated with performing arts, floor art, as well as cloth paintings that are unique in presentation, content and devotion. 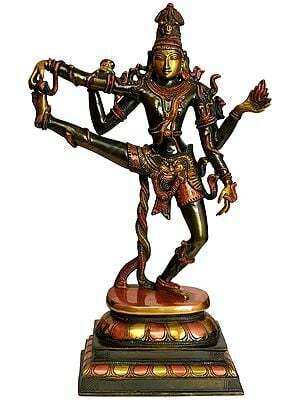 He is celebrated in all seasons and he is associated with festivals involving performing arts much more than any other deity. His personality, his deeds and his philosophy serve not only as themes for performing as well as visual arts but also psychologists and psychoanalysts. This volume with its detailed exploration, exhaustive information and liberal use of photographs is a must for all. 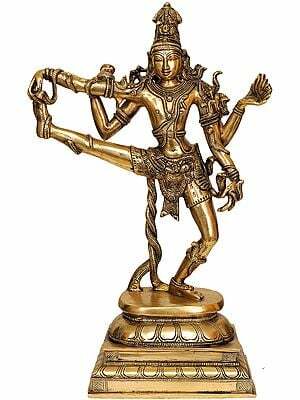 There are several interesting nuggets of information that are not to be found in other books on Krishna, including a comparative glimpse into the attributes of Shiva and Krishna, the two principal deities of performing arts. Shovana Narayan is the most celebrated and outstanding Kathak danseuse of India, whose phenomenal achievements in the world of dance have earned her several coveted laurels and titles. She has been conferred the most prestigious distinction of Padmashri as well as the Sangeet Natak Akademi awards by the President of India. Some of the other awards won by her include Delhi Govt's Parishad Samman, Rajiv Gandhi Puraskar, Bihar Gaurav Puraskar, Indira Priyadarshini Samman and Japan's Oisca Award. 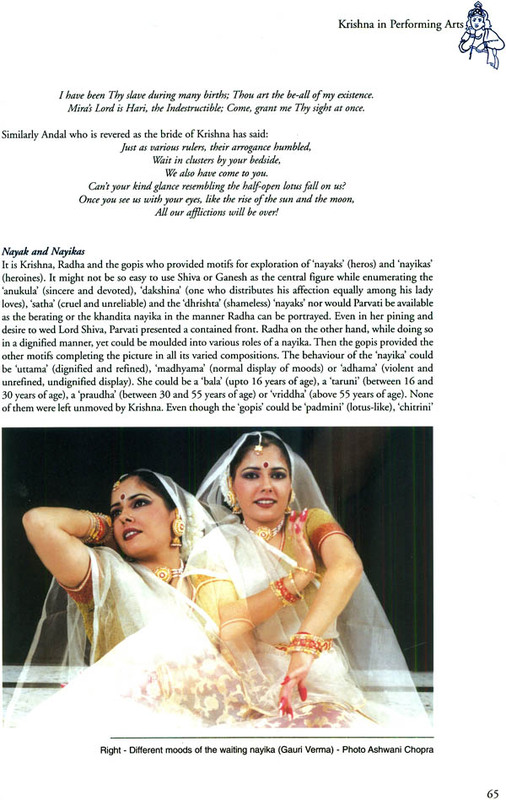 She has bestowed Kathak with dignity and enriched it with a deeper and wider canvas of expression and dimensions. She is at once, an explorer, a performer, a choreographer and an artiste par excellence, with values and a cause. 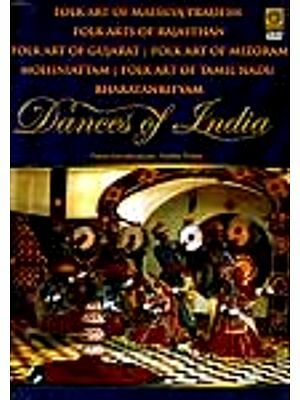 The explorer and researcher within her have seen her author nine books on Indian dance, which bespeak of intensity, depth and gravity. Transcending the mechanical framework, she is a bold and innovative choreographer and has also worked closely with nationally and internationally acclaimed Indian and western dancers and musicians from various streams of art. Shovana's palette contains other media, including films and operas as well as being a dedicated guru whose disciples are creating their niche in the world of Kathak that once again, bears testimony to the intensive training being imparted by her. A believer in humanity, she is also a promoter and organizer of several benefit concerts to raise funds for rehabilitation of victims of natural calamities while discharging her responsibility to society and to classical performing arts by organizing regular Festivals for the acclaimed and for the future tourch-bearers thus. Shovana Narayan is a classical example of a true Kathak, multi-faceted and dynamic, and presents a challenge to today's spectator. Her life and her works have made her a role model and peer for millions of girls of the younger generation of today. She is also a senior serving civil servant belonging to the Indian Audits and Accounts Service (1976 batch). Married to Dr. Herbert Traxl, Austrian Ambassador, the two have a son, Erwin Ishan Traxl. Her younger singer. Sesa ganesa mahesa dinesa, sureshahu jaahi nirantar gaawain Jaahi anaadi ananta akhanda, ached abheda subeda bataavain Naarad se suka byaas rahain pahi, hare tau puni paar na paavain taahi ahir ki chhoriyaan, Chhachhiya bhari chhaachh pe naach nachaavain. Life is an illusion. Life is a myth. Life has to be lived and actions have to be performed. Challenges, obstacles, adversities abound as do our fear, uncertainties and hesitations. It is Krishna who provides illumination with his life, his philosophy and it is he who guides us. He is symbol of emptiness of desire and ego. He is 'advaita' yet is 'dvaita'. He is supreme consciousness and supreme bliss. The attempt to write about Krishna's influence on performing arts is also an illusion for is it possible o hold a piece of sky, the (Infinite, in one's hand? But with typical failings of a mortal, this volume has been attempted. 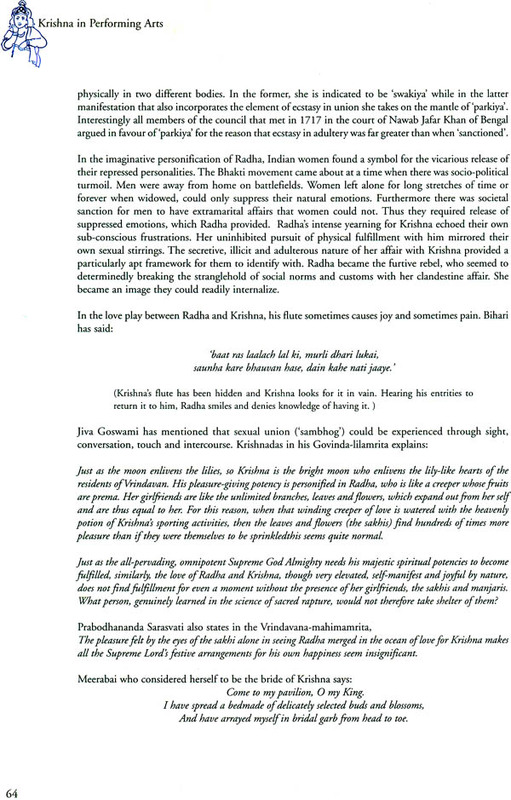 Chapter 1 seeks to bring together all information relating to Krishna, whether as myth or as reality. It also attempts to trace the development of his divinity through the help of records, verses and literature devoted to Him from pre-Christian era till the present age. 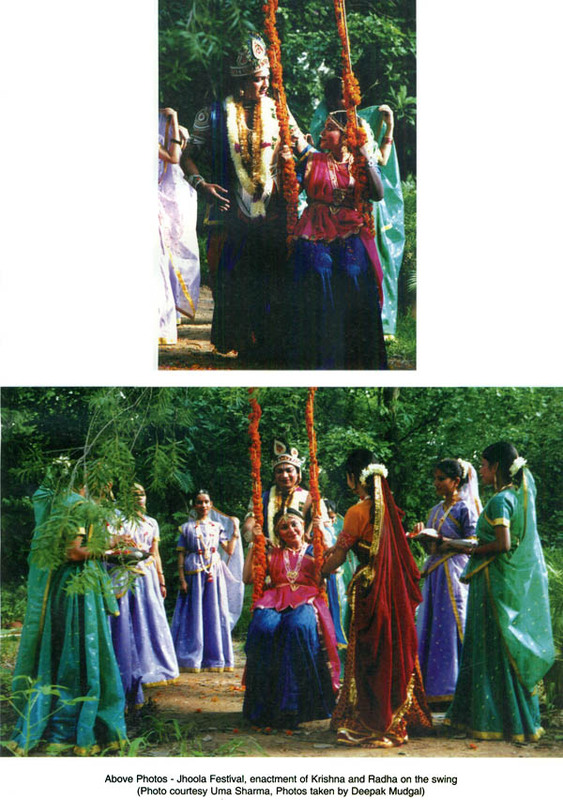 Chapter 2 makes a comparative assessment between Shiva and Krishna, the two presiding deities of Indian performing. Arts. This is the first attempt of its kind and dwells on the philosophy associated with their persona. 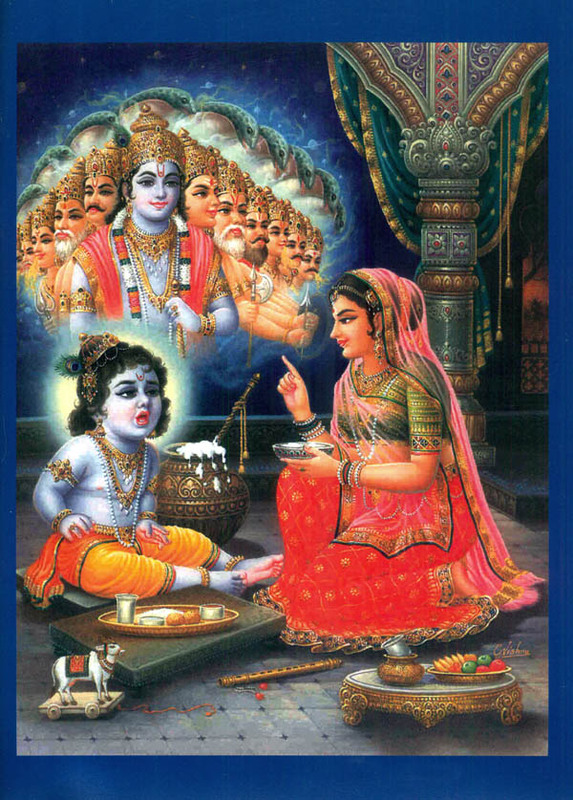 There is also a detailed discussion on 'bhakti bhavas', 'navarasas', 'ashtanayikas', 'nayak-nayika' codifications etc in relation to Krishna devotion and human values, social, political and philosophical concerns associated with him. 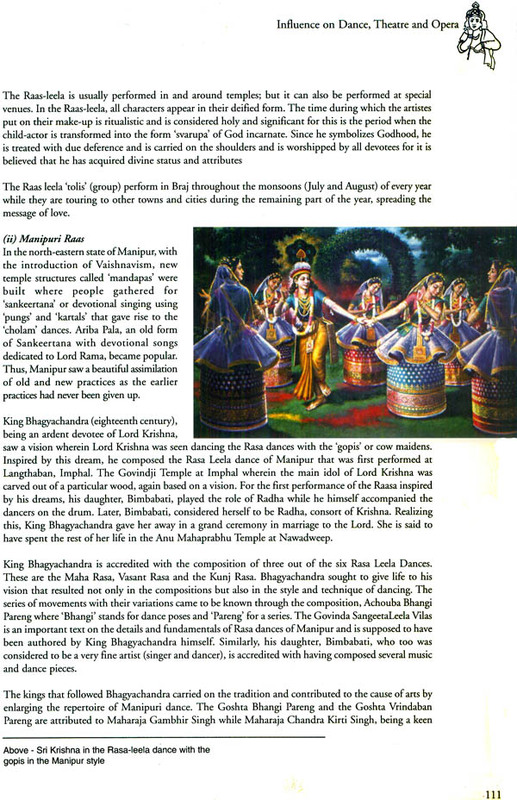 Chapters 3 and4 give comprehensive information on the multi-hued nature of Krishna's influence on dance, theatre, operas, ballads and music respectively. 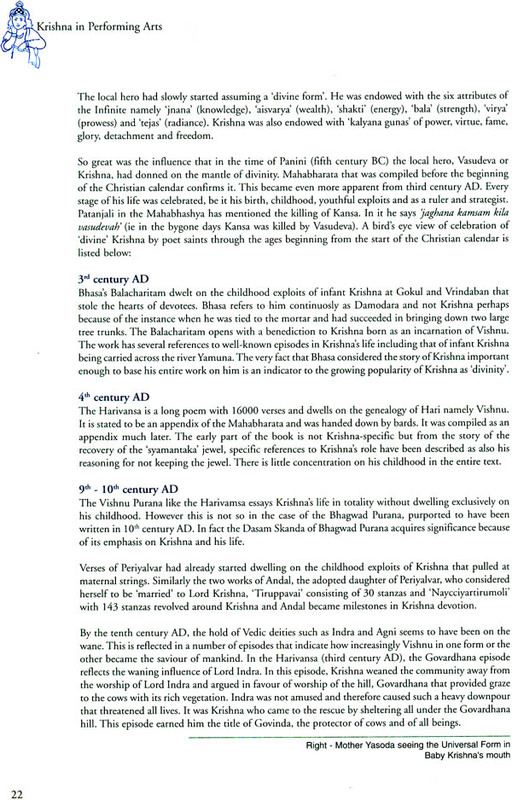 Chapter 5 for the first time provides a detailed calendar of festivals associated with Krishna, all of which have their share of ritualistic programmes of performing arts. Finally Chapter 6 gives details about the influence of Krishna on visual arts such as Sanjhi and a most of schools of painting that have provided backdrops for various stage productions.